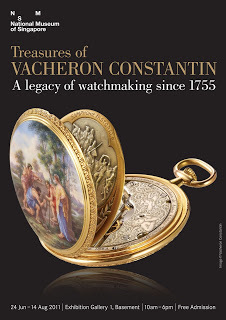 Together with the National Museum of Singapore (NMS), Vacheron Constantin will be organising the “first major public exhibition” of its historical pieces, from 24 June to 14 August 2011. Titled “Treasures of Vacheron Constantin – A legacy of watchmaking since 1755”, the exhibition will see 180 items will be on display, including timepieces, historical documents and watchmaking tools. In addition, artisans from the Vacheron Constantin manufacture in Geneva – Engraver, gem-setter, guillocheur, enameller and watchmaker – will be present to demonstrate their crafts. For those who have yet to visit the NMS, or have only memories of the old NMS, this is an excellent opportunity to do so. Even though the permanent collection of the NMS is nothing spectacular, museum is now an airy, cheerful space with a nice restaurant or two inside. In contrast, the museum of old, in which I spent quite a bit of time, was a dim and oppressive place.